Basketball League started up again for me this weekend, and it reminds me that I need to look into getting some new basketball shoes and some new shorts as well. I like wearing the Jordan brand shorts even if I don't play like Michael, more like the Japanese Shaq of my league, lol. I know, it's football season, so you Raiders and Chargers fans can go scoop up some team gear for 30% off. The 49'ers are making a toughness statement on D, yes, I was never a huge 49'ers fan but I had the opportunity to hang out with "Uncle" Jesse Sapolu and listen to his war stories from his 14 year career with the Niners in which he won 4 Super Bowl rings with Montana and Young in 1984, 1988, 1989, and 1994 and earned Pro Bowl honors in 1993 and 1994. On top of that, he's just a super warm and kind person. Uncle Jesse alone gives me a reason to cheer for the 49'ers, and I have to admire Mike Singetary's toughness resonating through the squad. Well, back to the reason I'm writing this, once again my friends and family, Foot Locker is having a F & F sale for thirty-percent off. So if you're looking for great shoe deals, or sales on sneakers, you might be able to go into the outlet section of the Footlocker.com and get an extra big hookup on some kicks. 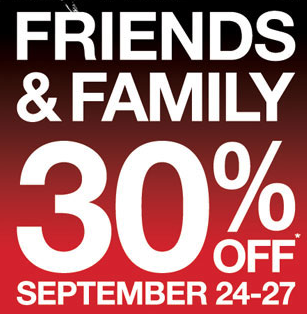 The Friends and Family coupon code is good for in stores and online shopping.